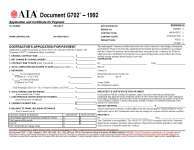 The AIA contractor form G704 is the Certificate of Substantial Completion for a construction project. The G704 ™ Certificate of Substantial Completion is a standard AIA document for recording the date of substantial completion of the work or substantial completion of a designated portion thereof. The contractor prepares a list of items to be completed or corrected, and the architect verifies and amends this list. If the architect finds that the work is substantially complete, the form is prepared for acceptance by the contractor and owner. Appended thereto is the list of items to be completed or corrected. The form provides for agreement as to the time allowed for completion or correction of the items, the date when the owner will occupy the work or designated portion thereof, and a description of responsibilities for maintenance, heat, utilities and insurance.